"The Forbidden City—a place of seclusion. A place where the godlike Ming emperors could rule and dwell without being inconvenienced by the ordinary citizens of the realm." Mysteries of Asia is a documentary television series, originally produced for The Learning Channel, which explores historical fact and theory surrounding some of the oldest structures in Asia. Newly-shot footage of the areas under examination is complemented by film clips (newsreel and fictional) and animated maps, narrated by Michael Bell. Despite the packaging's claim to contain all three episodes of this limited series, the DVD actually contains only two of the listed episodes, Jewels in the Jungle and Secrets of the Great Wall; the series' third episode, Lost Temples of India, is nowhere to be found. Jewels in the Jungle concerns the ancient Khmer temples of Cambodia, much of whose history is undocumented. This program examines the unusual mix of Hindu and Buddhist religious figures among the temples and gates built by the Khmer, and examines the walled city of Angkor in some detail. Cambodia's bloody recent history under Pol Pot is also discussed, and the program celebrates the survival of the ancient dances of Angkor, the only remaining cultural link to the distant past. Secrets of the Great Wall traces the history of the Great Wall of China and the numerous walls that preceded the one that stands today. It also discusses Emperor Chin's famous terra-cotta army and visits some remnants of earlier walls, urging preservation of today's Great Wall. This program incorporates a number of fictional film clips to illustrate points about the Emperor, the Forbidden City and the Mongol hordes; the clips liven up the proceedings a bit, but are a bit jarring on first appearance. Mysteries of Asia is nicely put together, with some beautiful photography and well-written narration. The programs are a little bit dry in tone, but the content is of interest and each 52-minute episode stands on its own, making this disc a good candidate for watching in multiple sittings. I hope Unapix has a repressing in the works to address the "lost episode" situation; in its current form, the DVD keepcase lists a running time of 156 minutes but the dual-layer disc itself is stamped with a running time of 104 minutes. Something clearly went awry in the production process, adding an unintended conundrum to the Mysteries of Asia. 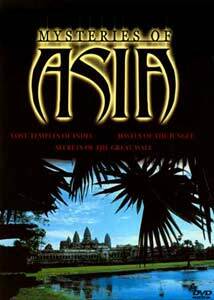 Image Transfer Review: Unapix presents Mysteries of Asia in its original 1.66:1 aspect ratio, letterboxed within a non-anamorphic frame. The image is slightly soft, but appears to have been transferred from a 24-fps film source at the proper rate (rather than from a broadcast videotape master) and color and detail are very good by documentary standards. The imagery is often nicely composed and photographed, and the DVD presentation presents the material with no digital distractions. Audio Transfer Review: Unapix presents Mysteries of Asia with three different soundtracks—Dolby Digital 5.1, Dolby 2.0 Surround, and DTS. The content of the three tracks is fairly similar, but the balance and clarity differ noticeably. The DTS track seems to have had the most attention paid to it, slightly clearer than the Dolby Digital tracks with the narration and surround effects mixed in at a higher relative volume level. The DD 5.1 track is quieter in the center channel but otherwise comparable to the DTS track, and the DD 2.0 track has louder narration but is noticeably less crisp than either of the discrete 5.1 presentations. The 5.1 tracks also make use of some ambient split surrounds (presumably added in post-production) missing in the 2.0 mix. This is documentary material, with most content centered and surrounds used for music and occasional atmospheric effects, so the differences among the three soundtrack formats are not as significant as they might be in a feature film context. All three tracks succeed in communicating the program content in a reasonably enveloping fashion without distracting flaws, so use the best soundtrack your equipment will support. Bonus points for the breadth of soundtrack formats. Extras Review: Mysteries of Asia contains no real supplements, just simple picture-menu chapter stops (a bit slow to navigate) and audio selection options. Oddly, the main menu leads to separate second-level menus for each of the two episodes included on the disc, making navigation a little bit awkward; an integrated set of menus for Audio and Chapter Selections would be more convenient, and it's annoying that one can't start either program directly from the main menu. But this is a documentary, and "extras" in the traditional sense aren't greatly missed on this DVD. Mysteries of Asia explores a few archaeologically significant areas of Cambodia and China, taking the time to discuss its subjects in some detail. Unapix's DVD presentation is quite solid, though the mysteriously missing third program is a cause for concern; this title might be best explored as a rental, especially if a new pressing is produced at some point to correct the current discrepancy between the package copy and the disc.